This page details the mechanics of mining ore. For a step-by-step beginner guide, see Mining Primer for Complete Beginners. For details about harvesting ice or gas, see Ice harvesting or Gas cloud harvesting, respectively. Mining is the activity of extracting ore from asteroids, though it is also used to describe ice harvesting and more rarely, gas cloud harvesting. Once extracted, ore can then be refined into minerals. 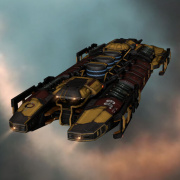 These refined substances are used in the production and maintenance of all player-created items and structures in EVE, such as ships and modules. It is one of the few professions immediately available to beginning players and many industrialists started their careers by mining. Mining is considered a very economically safe profession, as minerals are always in demand. Mining requires specialized modules or drones, and specialized mining ships also exist. Low entry cost: The Venture mining frigate is provided free as a mission reward from second Industry Career Agent mission. The required Mining Frigate I skill requires only 15 minutes of training time. Relatively low risk: It is usually very safe to mine in high-sec (the principal dangers being suicide gankers or war targets). Low level of involvement needed: In most scenarios, miners only need to be active 5 seconds for every 3 minutes (to target new asteroids) and an extra 1 minute for every 30 minutes (to unload the full cargo of mined ore in station). Guaranteed income: Mining products are always in high demand because ships and structures are constantly being destroyed and replaced, and replacing ships and structures requires materials. Mining in fleets with boosts can earn 15-20 million ISK per hour or more, depending on the resources being harvested. Fun factor: Mining in fleets is often a very social activity. Skill intensive: Despite the low entry cost, it takes a lot of training time to become an efficient miner. Non-transferable skills: Mining skills are useful only for mining. Fun factor: Solo mining, in particular, can be less than exciting. Mining fleets can provide conversation with other players in comms, but there usually isn't much going on otherwise. 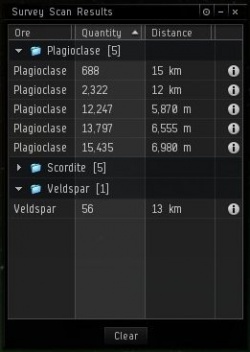 Income ceiling: It is difficult to earn much more than 10 million ISK per hour mining solo in highsec. While it's possible to earn more money mining in lower-security systems (at higher risk), other professions can be much more lucrative. In a mine, where a million diamonds shine. As their name suggests, asteroids are primarily found in asteroid belts, and most systems in New Eden have at least one. Asteroid belts can be viewed in the overview when enabled, and can also be viewed via the contextual menu by right-clicking in space. Each asteroid belt is composed of a variety of asteroids, each containing a particular type of ore noted in asteroid's name. The types and quantities of ore are determined by the security rating of the system and which quadrant it is located in. Rarer and more valuable ores are found in lower-security systems, and ore deposits tend to be larger there as well. Once depleted, asteroid belts do not respawn until downtime, so belts may sometimes be found empty, or lacking a certain type of ore.
Asteroids can also be found in the deadspace pockets created for certain missions, as well as in cosmic anomalies. While these sites are a bit more difficult to find, they also tend to have much less competition and have richer pickings. The basic mechanics of mining are very simple: Fit your ship with a mining module, approach and target an asteroid, and activate your mining module. At the end of each cycle (usually between 1 and 3 minutes, depending on the module used), the ore mined is automatically deposited in your ship's cargo or ore bay. The mining module will then automatically continue mining until either your cargo/ore bay is full, or the asteroid has been "mined out" (all the available ore in that asteroid has been mined and it disappears). Make sure that you keep the asteroid within range of your mining module (usually by stopping your ship, or orbiting the asteroid) - if you are too far away, the mining module will finish its current cycle regardless, but you will receive no ore. If you're using mining drones, launch your drones once you are near the asteroid, and give them the command to "mine repeatedly". They will then fly to the asteroid you have targeted, mine for one cycle (60 seconds), fly back to your ship, deposit the ore they have mined in your cargo or ore bay, then automatically fly back to the asteroid and continue mining it (until, as above, either your cargo/ore bay is full, or the asteroid has disappeared because it no longer contains any ore). Since the drones have to fly back and forth repeatedly between your ship and the asteroid, it's worth flying as close as possible to the asteroid to keep their travel time down to a minimum. Once your cargo or ore bay is full, bring the ore you have mined to a station (either fly there yourself, or transfer the ore to another player's ship to fly back (see solo mining and cooperative mining for more details)), then return to the asteroids and continue mining! Any ore mining module can mine any type of ore, with one exception: Mercoxit, the rarest ore type (and only source of Morphite minerals), which is found only in nullsec systems and can only be mined with Deep Core mining modules (any module with "deep core" in its name). In order to use these modules you need to train Deep Core Mining, and whilst they can be used to mine other types of ore, they are less efficient at it than "normal" mining modules. Mercoxit mining has one other notable feature: when you mine a Mercoxit asteroid, it will randomly release a cloud of toxic gas which will damage your ship if you're caught in it. Fortunately, the cloud only forms within 5 km of the asteroid, so keep your ship further away to escape any damage (note that this precludes you from using the basic Deep Core Mining Laser I module, as it has a maximum range of only 5 km). Alternatively, you can train Deep Core Mining, which reduces the chance of a cloud forming by 20% per skill level - in other words, at Deep Core Mining V, no clouds will form when you mine Mercoxit. All miners should attempt to maximize their efficiency (and therefore their profitability), which is typically measured by the amount of ISK earned per hour. When deciding what ore to mine, the driving factor is income per volume of ore (ISK per m3). 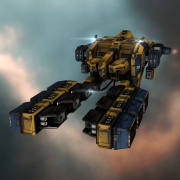 For example, Veldspar is the most common and cheapest ore in EVE and has a volume of 0.1 m3 per unit; Scordite is the next most common ore but has a volume of 0.15 m3 per unit. Therefore (ignoring mining crystals), you will always mine 50% more Veldspar than Scordite in a given period of time (since mining lasers mine a fixed volume of ore per minute). Therefore, in order for Scordite mining to be more profitable than Veldspar mining, Scordite's market price must in turn be 50% greater than Veldspar's. Since the market is player-driven, ore and mineral prices are ever-changing, hence miners should always check the market for the most efficient ore/mineral to mine for. Websites like Grismar's Ore Chart can look up the current market prices for ores and minerals, and give you a recommendation which ores are the most profitable. Remember to double-check the prices that any automated tools give you - they will often use regional averages to determine mineral prices; if you plan to sell your goods at a specific station or hub then your priorities might come out differently. Lastly, don't forget that most ore types are only found in a certain part of New Eden, and most miners prefer to operate only in certain parts of space. Once you have chosen what kind of ore you would like to mine, you will want to maximise the quantity you mine over time. This involves choosing what ship to mine in, what modules to fit to it, and what skills to train; see those links for more details. Moon mining can take place only at refineries anchored within 250 km of a mining beacon in 0.5 space or below and fitted with a Standup Moon Drill I service module, which appears on the outside of the structure as a giant laser turret aimed at the moon. The Moon Drill is then used to extract a chunk of the moon for mining. The extraction process is beyond the scope of this article, but once the chunk has been extracted, it exists as an asteroid field which contains both normal ore types and special moon-specific ores which can be mined for moon materials. After extraction, the mining is performed using the same mining equipment and processes described in this article, with the exception of Tier 2 modulated mining lasers requiring moon ore-specific crystals for good efficiency. Additional details on moon mining are available in the article on Moon mining. There are three types of ships used in mining: a mining ship, a hauler and a mining support ship. The Venture, an entry-level dedicated mining frigate. The best option for a new miner is to train into the Venture, a dedicated ORE mining frigate (before the Retribution expansion, each race had its own mining frigate, but this is no longer the case). The Venture and the necessary skillbook (Mining Frigate) are given out for free by the Industrial Career agents, and training the necessary skills takes only a few minutes. The Venture is a mini mining barge with a substantial ore hold (which minimises travel to stations to unload ore), very good mining yield and built-in warp core stabilisation (which makes it easier to escape from hostile ships). After a week's training, a budding miner should have the necessary skills to fly a mining barge, which have more than double the mining yield of a Venture, as well as even larger ore holds and/or a stronger tank. These ships are also more expensive (15-40M ISK, plus modules), but given that a Venture can mine about 500-700k ISK worth of ore per full cargohold, this money is soon earned. There are three different mining barges, each with a different focus (see table below). The last word in mining ships are the exhumers (Tech II variants of the mining barges). These ships require many more skills to fly, and are even more expensive, but have even greater mining yield, cargohold space and/or tank than the mining barges. Additionally, miners can train into the Prospect and the Endurance, improved and variants of the Venture which are designed for covert mining in dangerous areas of space and ice mining, respectively. Before the Retribution expansions, players often used cruisers or battleships as mining ships, but these ships are no longer competitive with mining barges and exhumers. A hauler's purpose is to take the ore that has been mined from a mining ship and transport it back to a refining station or to the market. Hauling is normally done in an industrial or a freighter. Finally, a mining support ship can either come in the form of a security detail against rats and players looking to steal ore, or as a ship designed to provide mining efficiency bonuses. The ultimate mining support ships are the Orca and Rorqual, of which only the Orca can enter high-security space and fit through normal stargates. Frigate Venture Low yield, tank and ore hold compared to specialized ship. Greater agility and speed. Is cheap and takes minimal training. Expedition Frigate Prospect Improved (but much more expensive) variant of the Venture. Can fit a Covert Ops cloaking device. Endurance Specialized version of the Venture, designed for mining ice. Mining Barge Procurer Specializes in defense (shield tank). Retriever Specializes in ore hold capacity. Covetor Specializes in ore yield. Exhumer Skiff Specializes in defence (shield tank). Mackinaw Specializes in ore hold capacity. Hulk Specializes in ore yield. Support Command Ships Can fit gang assist modules and provide security. Industrial Command Ships (Small) Porpoise Bonuses towards Command Bursts, has considerable cargo room, can fly in high-sec. Industrial Command Ships Orca Bonuses towards Command Bursts, has considerable cargo room, can fly in high-sec. Capital Industrial Rorqual Capital ship, bonuses towards gang link modules, can compress ore in cargohold (vastly increasing capacity). Mining (1x): +5% ore mining yield per level. Astrogeology (3x): +5% ore mining yield per level; requires Mining IV. These skills are the bread and butter of any miner and should be trained up to level IV reasonably quickly (primarily for the increased mining yield, but Mining IV in particular is a prerequisite to many other mining-related skills). However, note that these skills only increase the yield for miner ore mining! Ice Harvesting (1x): Required for Ice Mining. 5% reduction in cycle time per level. Gas Cloud Harvesting (1x): Required for Gas Cloud Mining. Allows use of one gas cloud harvester per level. Note that the skillbook is very expensive (about 20-30M ISK)! Deep Core Mining (6x): Required for mining Mercoxit (a rare type of ore, only found in nullsec or wormholes). These skills are only relevant if you want to expand from basic ore mining to Mercoxit, ice, or gas cloud mining. Mining Frigate (2x): Needed for the Venture. Expedition Frigates (4x): Needed for the T2 hulls Prospect and Endurance. Mining Barge (4x): Needed for the Procurer, Retriever, and Covetor. Exhumers (5x): Needed for the T2 hulls Skiff, Mackinaw, and Hulk. Industrial Command Ships (8x): Needed for the Porpoise and Orca. 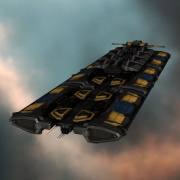 Capital Industrial Ships (12x): Needed for the Rorqual. In addition to letting you fly the mentioned ships (which only needs level I), training higher ranks of these skills greatly enhances their respective ships. For instance, the Venture gains +5% mining yield per level of the Mining Frigate skill - which is on top of the bonuses provided by Mining and Astrogeology! So if you've found a ship you like, train the corresponding spaceship command skill to make it even better. Mining Upgrades (4x): Required for fitting and using Mining Upgrades. Requires Mining III. Drones Rigging (3x): Required for fitting mining drone augmentor rigs (requires Jury Rigging III). As mining lasers and mining upgrades are CPU-hungry, training CPU Management will make it easier to fit your ship. Drones (1x): Increases number of drones in space by 1 per level, for a maximum of five drones in space at level V.
Drone Interfacing (5x): Increases drone damage and mining drone yield by 10% per level. Requires Drones V.
Mining Drone Operation (2x): Increases mining drone yield by 5% per level. Requires Drones I. Mining ships use drones both for defence and increased mining yield. The Drones skill is the foundation skill, and should be eventually trained up to V (once you start flying Exhumers it's highly recommended, and valuable even before). To use drones defensively, train up Light Drone Operation, whilst mining drones need Mining Drone Operation. Drone Interfacing is somewhat of a long train, but even getting it to level IV makes a big difference in how effective your drones are. Advanced Drone Avionics is only needed if you plan to use ECM drones, and the drone specialisation skills are needed when you start using Tech II drones. For more details on how drones work, see drones. Leadership (1x), Wing Command (8x), and Fleet Command (12x): Increases Command Burst area of effect. Mining Foreman (2x): Increases duration of Mining Foreman Command Bursts. Requires Leadership I. Mining Director: Increases the strength of Mining Foreman Command Bursts. Requires Mining Foreman V.
Command Burst Specialist (6x): Reduces reload time for Command Burst modules. Requires Leadership V.
These skills become highly desirable once pilots start flying Orcas or Rorquals, and want to run mining fleets (and provide mining boosts to your fleet members). For more details on how fleets and Command Bursts work, see Command Bursts. Almost all the mining ships are shield tanked, so shield tanking skills are useful to make them less vulnerable to ganking. General fitting skills will improve the PG and CPU output of your ship allowing better fits. If you are still short on CPU, Electronics Upgrades allow you to fit co-processor modules (which increase your ship's CPU further). Mining upgrade modules increase your mining yield, while drone augmentor rigs increase the yield of mining drones. A number of implants can improve a miner's performance, such as increasing mining yield, increasing laser range, or decreasing the CPU penalty for mining upgrade modules. For details on these implants, see implants and skill hardwiring implants ("Industry" implants). When you warp to an asteroid belt, you will land in the middle of a semicircle of asteroids about 50 km in diameter. Since the (unboosted) range of mining lasers is only 10 km (15 km for strip miners), you will then need to fly closer to your target asteroid in order to mine it - and mining ships are not particularly known for their speed. You can cut down on this travel time by using bookmarks, which allow you to warp directly next to an asteroid, and start mining immediately. If you're using mining drones, it's particularly important to be close to your target asteroid, as the drones have to otherwise spend a lot of time travelling back and forth between your ship and the asteroid. It can be helpful to create bookmarks in the asteroid belts you mine in frequently. While there are many different approaches to creating these bookmarks, the picture on the right shows a simple example: warp to an asteroid belt in a fast ship (e.g. a shuttle or a frigate), and create three bookmarks along the perimeter of the belt. Position them in such a way that most of the belt is within 15 km (the range of a strip miner) of any of the three bookmarks. Then, switch to your mining ship, and warp directly to one of the three bookmarks. You will then have a large selection of asteroids within range of your lasers, and be able to efficiently use mining drones on the closest ones. If a part of the belt is depleted, warp to a nearby celestial (e.g. a planet) and then warp back to one of the other bookmarks in the belt. When mining in NULL sec space it is extremely important to create a couple of tactical bookmarks around the asteroid/ice belt that you should warp to first. When you are in a large mining ship the align and warp speed can mean that hostile pilots can appear in local and beat you to the belt before you get there. By warping to the tactical bookmark first you are giving yourself a chance to warp away to a safe spot or station before the hostile pilot can get a lock on you. The results of a survey scan. Note the different kinds of asteroid which make up this asteroid belt, and the different amounts of ore in each. The survey scanner (a mid-slot module) is a very useful tool for any asteroid miner, as it shows how much ore each asteroid in the vicinity contains. This is important, as asteroid mining modules (mining lasers and strip miners) will always complete an entire cycle (60s for mining lasers, 180s for strip miners), irrespective of how much ore is actually left in the asteroid. For instance, say you are mining an asteroid which contains 200 units of Veldspar (Veldspar has a volume of 0.1 m3 per unit, so this asteroid contains 20 m3 of Veldspar). Your Mining Laser I has a yield of (say) 100 m3/min, and a cycle time of 60 seconds. Even though there are only 20 m3 of Veldspar left in the asteroid, the module will complete its entire 60 second cycle before shutting off (with a message saying "the asteroid is depleted") - but those 60 seconds of mining only yielded 20 m3 of ore (instead 100 m3)! The problem becomes even worse when using strip miners, as they have a much higher yield and a cycle time three times as long - which can result in a lot of wasted time if you're mining asteroids that don't contain much ore. Therefore, when mining, refresh the survey scanner window from time to time (it does not refresh automatically, you need to reactivate the survey scanner module) to check whether the asteroid(s) you are mining are close to depletion. If an asteroid is almost empty, you can "short-cycle" your mining laser (i.e. turn it off manually before it completes its full cycle, by clicking on it) to mine out the last dregs of ore before moving on to another asteroid. Note that each time you activate your mining laser it takes energy from your ship's capacitor; activate it too often and you might empty your capacitor and have to wait a moment for it to recharge. You can target asteroids directly from the survey scanner window (much like the asteroids in the overview); this can be a useful shortcut to help you mine the particular asteroid you're interested in. A little marker shows you which asteroids you are targeting (note that, just like the rest of the information, this is only refreshed when you refresh the survey scanner window). Survey scanners can be used to provide the approximate value of an asteroid belt with the help of 3rd party appraisal tools. This activity is relatively easy when in a fleet that provides range bonuses to Survey Scanner. 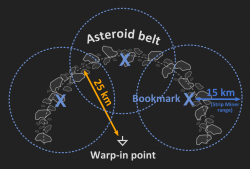 Without range boosts an estimate can be done by scanning one area of the belt at a time and removing duplicate asteroid entries before submitting. Buy values in Jita or one of the other Trade Hubs would be the closest estimate to actual returns from an immediate sale of the ore. There are several methods commonly used in mining, the most basic only requires one account and can be run by very low skilled players, while the most advanced will require multiple players all performing separate tasks in order to be effective. The most basic way to mine is to fill the ore hold of a ship full of ore and then return to a station to drop it off. Its advantages are that it requires only one character, can be done at very low skill levels and is completely theft-proof. Its disadvantage is that the time you spend travelling to and from a station is wasted (i.e. not spent mining) - however, most mining ships (with the notable exception of the Covetor and the Hulk) have large enough ore holds that they do not need to return frequently to a station to unload. As an example: An average-skilled miner flying a Venture can mine about 250 m3/min of ore, which is enough to fill the Venture's ore hold (5000 m3) in about 20 minutes. Given that the Venture aligns and warps like a frigate, round trips to a station will take only a minute or two, so very little time is lost. A highly-skilled miner flying a Hulk, on the other hand, can mine about 1600 m3/min of ore, which will fill the Hulk's ore bay (8500 m3) in about 5 minutes, requiring frequent return trips to a station (made longer by the slow align time and warp speed of the Hulk). Players can jettison items from their cargohold into space, which results in a cargo container (more commonly called a "jetcan" or just a "can") forming within 2,500m of the ship. This jettisoned container has a volume capacity of 27,500 m3. Miners can take advantage of this capacity by transferring the ore in their cargohold into the jetcan. Typically a player will fill a jetcan with ore, and then (once the jetcan is full) swap to a ship with a larger cargohold (most often an industrial ship) and haul the ore to a nearby station. If you're flying a mining ship with an ore hold that's considerably smaller than a jetcan (such as a Venture (5000 m3 ore hold) or a Covetor (8000 m3 ore hold)), this method can increase your efficiency, as you can spend more time mining and less time hauling. However, jetcans only have a lifespan of 2 hours and they are not secure, meaning anyone can open and remove items from a jetcan. This is a common form of theft and griefing in the game, where a player will "flip" a jetcan either to steal the ore or to induce a fight without CONCORD intervention. While it's possible to combat this by using secure containers (which can be programmed with a password), the largest of these (the giant secure container, often called a GSC) can only hold 3,900 m3 of ore, which is less than the ore hold on even the smallest mining ship. As nearly all mining ships have ore holds which are as large or larger than a jetcan (in addition to the time lost in changing ships and the risk of getting your ore stolen), using jetcans is probably not worth your time. They do, however, come in very handy if you're mining with two accounts or in a fleet (see below). Given their small size, using GSCs for mining is not worth it (although it was a commonly-used practice in the past, when mining ships had much smaller cargo holds). If you have two Eve accounts, you can multibox them (i.e. play them on one computer simultaneously). One of these can mine while the other ones flies a hauler to drop the mined ore at a nearby station. The miner transfers the mined ore into a jetcan or a GSC (see above) which is then picked up by the hauler. This way, the miner can mine non-stop, obtaining more ore. Eventually, the hauler character could train towards an Orca (to provide mining boosts to the miner, further increasing yield), while the miner character is free to train and fly ships like the Hulk, which have very high mining yield but small ore holds. See Creating an Alt Hauler and Creating an Alt Miner for tips on creating these alt characters. The Orca: the easiest way to make yourself loved by miners. Of the professions in Eve, mining and production are most impacted by the player’s efficiency. For miners, it’s all about mining. Time spent hauling, killing rats, moving cans or dealing with ore thieves, can flippers and other flavors of griefers is time not spent making little rocks out of big ‘roids. Anything that can be done to eliminate or minimize the impact of all of those other factors means more little rocks in the hold, which means a fatter wallet. A properly designed and staffed co-operative Mining Fleets allows miners to spend their time doing what they do best: mining. It also allows the miners to benefit from mining yield bonuses available only to members of a group. These bonuses can add an additional 10% or more to a miner’s yield. If the miners are mining, then someone has to haul the little rocks to the station. If the op is in lower sec regions, something other than drones may be needed to protect the miners from rats, not to mention thieves and assorted other scoundrels. Those protection activities will result in a second “mining” operation as the wrecks are looted and salvaged for the benefit of the op participants. Our theoretical op has miners, haulers, damage dealers and salvagers; a fairly broad slice of the possible professions in Eve! Mining ops are generally more relaxed than combat fleet ops, co-operative mission running or complex clearing. Chat and/or Mumble deal with a wider variety of topics and separating the required tasks to specialists provides everyone time to participate in the conversations. Not only does this atmosphere provide a social element of connection with the other members, it lets the "teaching" move beyond mining to cover a myriad of subjects. The next type of fleet is more structured. A standard mining fleet in high security space generally includes a mix of mining barges, exhumers, and haulers (industrials). The miners will work on a single belt constantly, and transfer the ore they mine into a jetcan. The haulers will ferry the resources from space to a station. This makes for increased proficiency as the mining lasers never need to stop, unless you need to switch belts. Fleet boosters are usually present here as well, and an Orca may be used instead of a jetcan. Mining fleets in low-sec will also include combat ships to protect the fleet against rats and hostile players. Since all the ore is combined into a single pot (and often refined and sold later), you need to agree on a method of splitting the proceeds from the mining fleet between the participants. 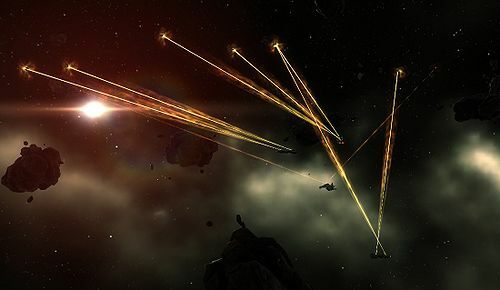 Since a fleet often includes not only miners with different skill levels flying different ships, but also fleet boosters, haulers, combat ships etc, the simplest way to split the ISK proceeds is to allocate them based on time spent in the fleet; however, this might discourage larger ships from joining the fleet. Scrapyard's Mining Op Worksheet can accomodate several different methods of weighing the contributions of fleet members. Whichever way you choose, make sure that the method of splitting the ISK is agreed upon by the fleet before the mining op starts. Periodically, the Uni will undertake a large-scale, long-duration mining operation. These expeditions are planned and announced several weeks in advance to allow for adjustment of training schedules, acquisition of desired ships and fittings and research/scouting of the target system and surrounding space. Because of the travel involved and the length of planned stay, expedition locations generally provide opportunities for mission/complex running as well. The Expedition Boss for a particular expedition will publish the rules for that expedition, including record keeping requirements for any Common Can portions, rules for interaction with locals and what happens to the ore mined. Such fleets are often run to donate minerals to the University, with the added bonus of attempting to break the record for the previous donation fleet. This page was last modified on 23 March 2019, at 07:58. This page has been accessed 465,018 times.